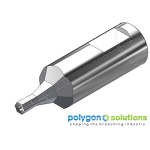 Polygon’s standard 7/64” hexagon rotary broaches are made from high quality M-2 high speed steel and precision ground to tight tolerances for superior broaching performance. 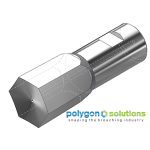 Ground shank diameters insure that Polygon’s 7/64” hex broaches fit all commercially available broach holders. Nominal sizes meet ASME standards for hexagon sockets and include pressure relief vent holes to reduce pressure and improve tool life. 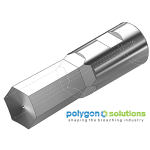 Standard broaching depths are 2x the across flat dimensions and provide maximum clearance. Custom options include premium broach materials, coatings, dimensions and tolerances. 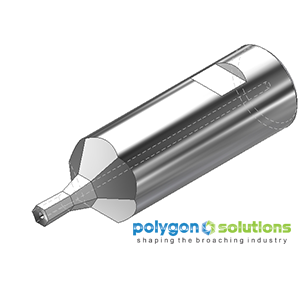 Polygon Solution’s 7/64″ Hex Rotary Broach cutting tools are designed for superior performance when machining aluminum, brass, and mild steel. Polygon recommends drilling the pilot hole 3% oversize for hexagon forms. Pilot holes should also include a chamfer and extra depth for chip accumulation. Expect reduced tool life when broaching tougher materials and tighter pilot holes.